Making it Easy to do Business with Roanoke County – An ArcGIS Site Selector and Open Data Portal Success Story! 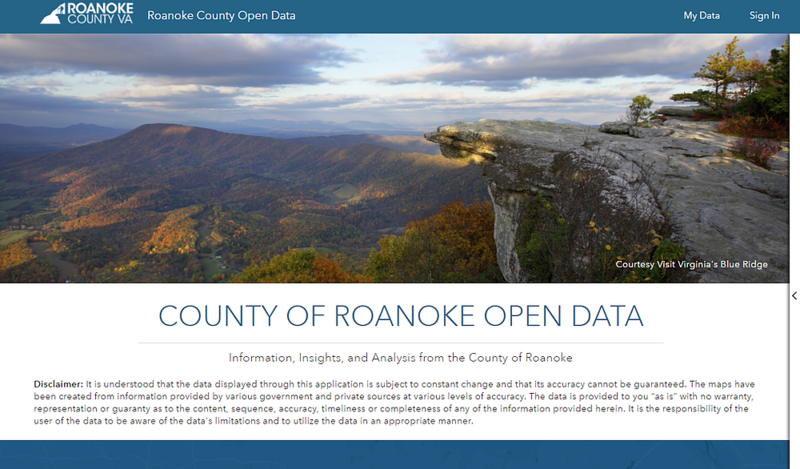 Roanoke County, Virginia has been an early and steady adopter of many of the Esri suite of ArcGIS Solutions for Local Government to help construct an enhanced user experience for employees and citizens alike. This approach has resulted in a range of offerings that support the functional needs of a broad audience, but relatively recently the County directed renewed attention to the area of economic development, in particular. The basic premise underlying this effort…to make it easy to do business in Roanoke County! Consistent with the approach that has resulted in so many successes, the County looked to configure first and customize second. 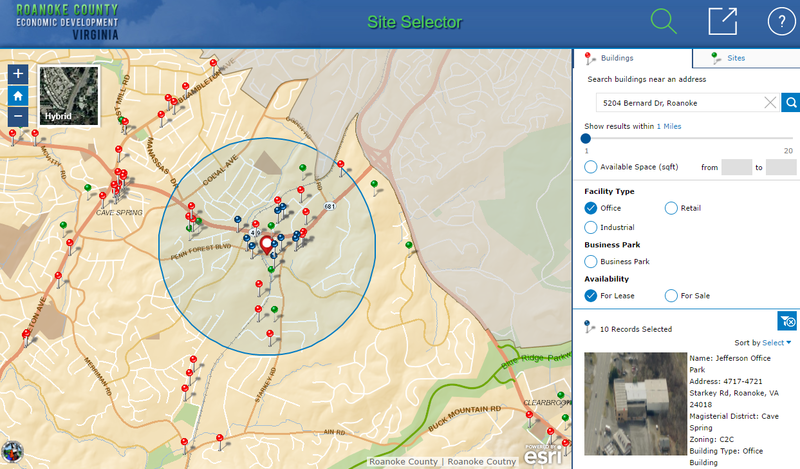 That is, the County identified Esri solutions that were most aligned to the desired functionality and experience and leveraged the templates out of the box to evaluate fit. Because the templates are so accessible and readily configured, the County could deploy relatively quickly to support internal discussion and functional evaluation. With buy-in from technical staff and stakeholders, the County then worked with GISinc to enhance, extend, or modify according to targeted feedback. The data necessary to support the selection process existed within the County, but was housed in different locations and formats that could not be queried conveniently and simultaneously, resulting in a process that could often take County staff on the order of 3 hours to complete for a given inquiry. Multiplied by the number of inquiries per week or month and by potential iterations of each, the effort to support site selection was extensive! The Site Selector template is intended to allow users to gain access to that wealth of underlying data and information through a consolidated, user friendly interface. 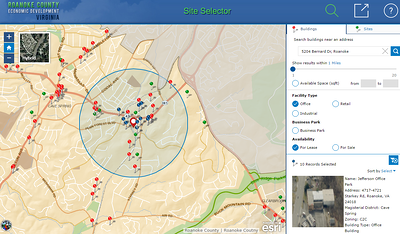 Interactive filters allow users set criteria or even run scenarios to identify locations. Of course, while the base functionality was robust, the County requested further customizations to presentation, interface, and function. A custom location search was added to support looking for locations by address, PIN, owner name, or place name through a single text box. Further, the team altered the layout and behavior of the filters, enhanced the presentation and symbology of the results, incorporated localized/custom reporting, and integrated with other County applications. Perhaps most importantly, the County worked with GISinc to refine the Share function, which truly enabled Economic Development staff to streamline their process and save significant time. The approach that previously took 3 hours per inquiry can now be accomplished in a fraction of the time and shared digitally to the prospective businesses directly through the application, which allows them to further explore independently and more interactively. Of course, helping businesses to locate in Roanoke County is just one way of making it easier to do business in the County. Established businesses also frequently interact with County staff to obtain information or data that allows them to conduct their respective business. Although much of this data is accessible through the suite of applications offered through the County’s GIS, many businesses require direct access to data to explore and manipulate as appropriate. Once again, this process is facilitated by County staff who have historically responded to requests with a manual extraction and delivery of data. ArcGIS Open Data offers another out of the box solution to streamline an existing process. Through configuration, the County can accommodate independent exploration of data inventory and on demand user access to downloadable content, relieving County staff from responding to the frequent calls for data. Open Data not only saves time for the County staff, but for businesses as well, who now have self-serve access to a repository of County data. Out-of-the-box, Open Data allows data and applications to be organized into intuitive categories that make the self-serve model friendly and feasible. In this case, the core functionality of the Open Data application is leveraged as is and without further functional modification or enhancement. Instead, the County worked with GISinc to inject custom styling that presented a branded interface that is both aesthetically appealing and consistent with County convention.